If you’re like most people, you need to power more than one electrical device at a time, so you use a power strip. Also known as power taps, power strips are lengths of electrical sockets that are designed for powering multiple appliances. Unfortunately, many people don’t know how to properly use power strips and don’t realize that they can be extremely hazardous when not used correctly. If you have power strips in your home or office, here are the basic safety guidelines on how to correctly use these products, along with some warnings on how they should not be used. Only use power strips with circuit breakers to prevent the possibility of fire. Restrict their use for just low voltage electronics, such as computers, small clocks and lights. Plug power strips into permanently installed receptacles. Keep your power strips in a dry environment because electricity and water don’t mix well. This involves being sure that your power strips are not near water or any other type of liquid. Never use power strips for applications requiring heavy loads, including heaters, refrigerators, shop equipment, microwaves and other appliances. Don’t use them in applications requiring constant loads. Avoid using power strips in applications or facilities, such as a healthcare environment, where power is critical. Never use power strips outdoors, particularly during damp weather. Besides being exposed to moisture, power strips used outdoors can be subjected to bugs, dirt, debris and other elements that could get inside unused ports and result in failure. Don’t “daisy chain” power strips. 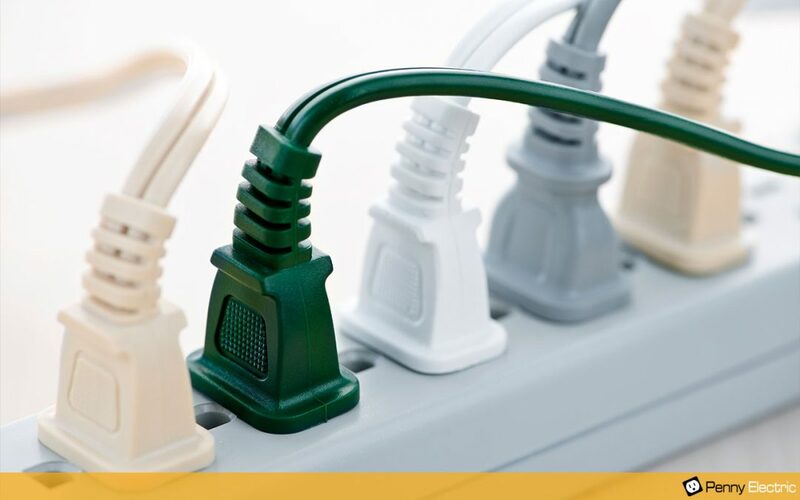 This is a term that involves connecting power strips to other power tabs or extension cords, which can result in overloads, causing damaged appliances or even fire. Never drill or staple power strips for mounting. Always use proper mounting procedures including tabs or hangers often molded into power strip housings. Often, people confuse power strips with surge protectors, but they’re not the same thing even though they look alike. While a power strip is simply an extension cord that consists of several outlets, a surge protector contains an additional element that is inside of it. This element is designed to clamp the surge, meaning that it can remove the surge so that a flat-screen TV, computer, stereo or other types of electronic equipment are protected from power irregularities or voltage spikes. Surge protectors provide an additional layer of safety and protection and are a good ideas on power sensitive applications. Some power strips have a push button that trips automatically when a strip gets too hot to be safely used. Power strips are not intended as a permanent substitute for a wall receptacle. Power strips should not be routed through ceilings, floors, walls or other openings. If a power strip feels hot when touched, promptly unplug it. Immediately discard any cord that shows physical damage, such as cracks, exposed wires or splices. Inspect your power strips for any knotted or wound cord, keeping in mind that a power strip cord needs to lie straight while being used. Always use the right type of power strips. Before buying a particular product, check to ensure that it is UL (Underwriters Laboratory) certified and meets safety standards. Be sure that a power strip with a long cord isn’t a tripping hazard, considering that a power strip should not have a cord that’s longer than six feet. Don’t place a rug over a power strip cord as this can eventually lead to wires breaking in the cord. These wires can begin heating up which can cause a smoldering fire. As this typically occurs at night, this situation is extremely dangerous. If you have a garage that isn’t climate controlled, you’ll need a hard-wired power strip that’s installed by a professional electrician. Installing additional outlets and other types of electrical jobs should only be handled by a highly qualified, experienced and licensed electrician. What’s more, electrical inspectors are trained to properly use power strips and can point out the electrical risks as a result of their misuse. For help with additional power supply in your home or office, call Penny Electric. Our company has a proven record of serving homes and businesses in the greater Las Vegas area and is highly experienced in product compatibility for our hot desert climate. And please contact us with any questions or for pricing on our wide range of electrical services.